When you look at a sunflower, you’re really looking at a composite of tiny flowers, or florets. The same is true for asters, daisies, and other members of the composite family of plants. The colorful “petals” of a sunflower are actually a series of tiny florets, called ray flowers, and the seed-producing dark center is made up of lots of disk flowers. Together, they join together and function as one large flower that attracts pollinators and produces seed. 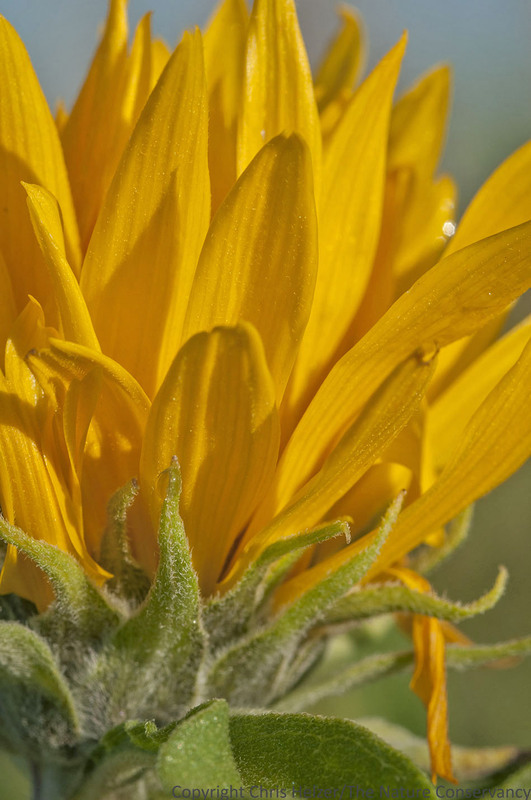 This sunflower has two kinds of flowers – ray flowers that look like yellow petals, and small disk flowers in the center. This is how sunflowers are “supposed” to look. However, you will occasionally find a sunflower that looks more like a chysanthemum, with yellow ray flowers across most or all of the face of the flower head. Botanically speaking, this is called “double flowering”. Horticulturists find and breed double flowering varieties of sunflowers and other composites, and you can find them at many nurseries and other plant stores. 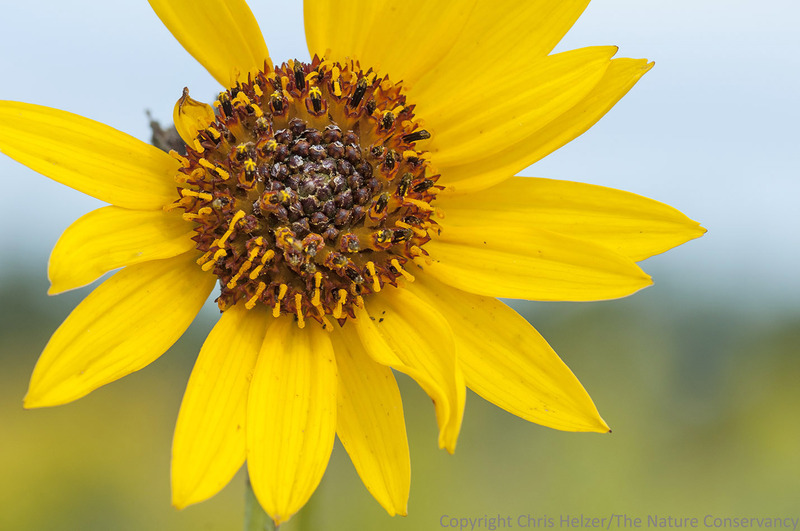 A double flowered Maximilian sunflower (Helianthus maximiliani) at The Nature Conservancy’s Bluestem Prairie in Minnesota. Most of the disk flowers have been replaced by ray flowers. When we were in Minnesota a few weeks ago, we saw a fair number of double flowered Maximilian sunflowers at The Nature Conservancy’s Bluestem Prairie. I don’t remember seeing so many examples in one prairie before, but maybe I just haven’t paid close attention. The abundance of them made me curious to learn more, so I did a quick internet search when we got back to Nebraska, and emailed a few botanist friends for more information. The best information I found was related to a 2012 PLos Genetics journal article in which scientists described their discovery of the particular mutation that causes double flowering to occur. You can read descriptions of the research here and here. Extra “petals” can be awfully pretty. You might think of genetic mutation as something bad, but mutations are actually very common and mostly benign (and don’t affect form or function). Now and then, a mutation can cause serious problems for an organism, but other times it can generate variations in a DNA sequence that turn out to be advantageous. Double flowering seems to be somewhere in the middle. On one hand, producing fewer disk flowers means the plant has fewer opportunities for pollination and seed production. On the other hand, extra ray flowers could make a plant more attractive to insect pollinators and increase visitation. In the case of the Maximilian sunflowers at Bluestem Prairie, the mutation doesn’t seem too disastrous, at least based on the number of plants we saw that have the trait. I’m glad – it sure is pretty. 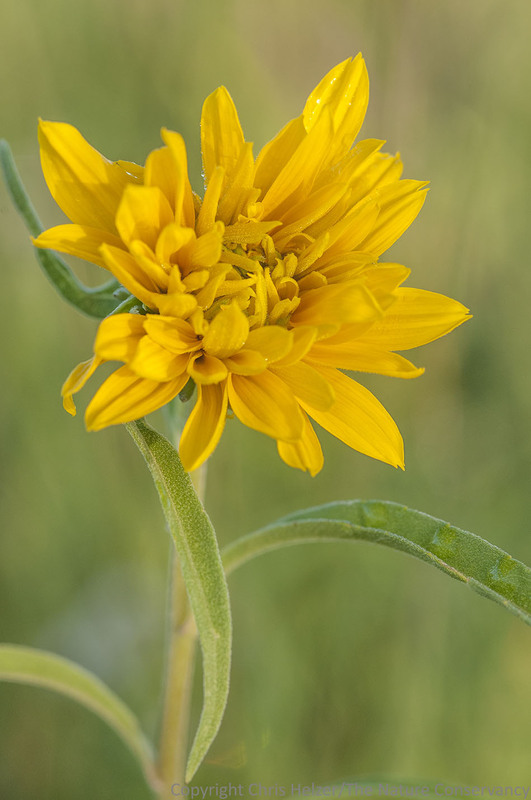 This entry was posted in Prairie Natural History, Prairie Photography, Prairie Plants and tagged bluestem prairie, composite flower, double flowering, extra petals, maximilian sunflower, preserve, sunflower, the nature conservancy by Chris Helzer. Bookmark the permalink. That’s really interesting and I’ve seen a few exotic members of that family doing this but cant say I have ever seen this in Australian native daisies. Has increased visitation to these double flowered daisies been tested before? I am not a (but a would-be) botanist, and am wondering if it would be appropriate to ask/suggest topics that I have not seen you address. I appreciate all the scientific information I get from your blog and follow all the links. The info on the genetic mutations of sunflowers is fascinating and something I’ve wondered about. Some of the other “stuff” I’m curious about: What is the relevance of pH in prairie soils; how much do different goldenrod species add to biodiversity; what are some examples of resilience (this Q because I’ve heard of some situations which may be either anomalies or a real source of hope for the future of native plants, with or without human intervention). Thank you, Chris, for being the best of teachers, and thank you, too, too, to your Fellows for the great insight they provide! Chris, great suggestions. I’ll see what I can do. YES, I find this double sunflower to be lovely!